Thanks for stopping in and visiting our home page. My name is Faye Jarvis Moran and genealogy is my hobby. I was born and raised in NC, as was my fourth cousin and homepage partner, Elizabeth Harris. Lib is working on a general database of early settlers in the Moravian community in and around Winston Salem, NC. Many of my direct ancestors lived in or near the Moravian community, settling in the Clemmons and Lewisville area. Lib and I are still working to include many more early settlers in this region. 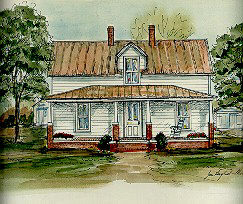 The above painting is the "old" Jarvis homeplace, built by my grandfather at the turn of the century. It stood on the site where Tennyson Jarvis first built his home in 1850 and "up the road just a piece" from where James Jarvis settled in 1781. My Jarvis family starts with James Jarvis and Sarah Kelly in Frederick County, Maryland. The links below will lead you to the documentation of their lives, the people they met, their neighbors, the person they married, and the ones they left behind. "History is a study of the past. Tradition is the bridge between the past and the future." -- David Lewis. The Salem coffee pot was made in 1858 as a sign for the tinsmith's shop. It still stands in Old Salem. We hope you enjoyed your visit and found the information useful ...The Web Counter count says you are visitor number: If you have any questions, suggestions, or information about any of the surnames on our page, you can e-mail Faye Jarvis Moran faye@fmoran.com or Elizabeth Harris at ncgen@mindspring.com. Please contact either of us if any of the links are not working properly. Image created by Elizabeth Harris.